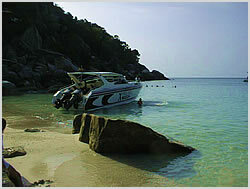 Located to the north of Koh Tao the area around Mango Bay makes a nice relaxing dive. With depths ranging from 2 to 15 metres its ideal for beginners and snorkellers. Hard and soft coral formations here are plentiful along with a variety of sponges and clams. The bay is only accessible by boat and makes a popular snorkellers day trip. Drop in further around the northwestern tip of the island and drift into the bay area to avoid the crowds.